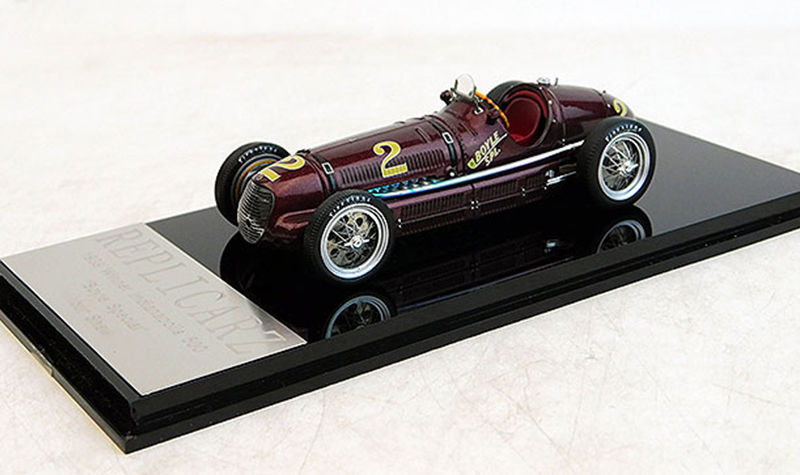 Replicarz exclusives – Racerhead Gift Guide Holiday gifts for model lovers. American racing subjects have generally been ignored by the modeling industry. Most notably Indianapolis 500 cars and Land Speed Record cars that run at the Bonneville Salt Flats. Model retailer Replicarz has taken it upon themselves to remedy the situation with their line of Replicarz Exclusives. 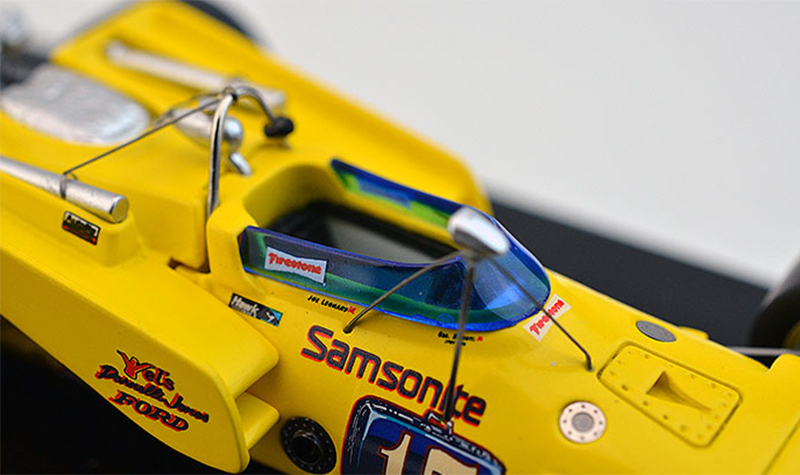 Becoming a manufacturer of model miniatures is no small task because many subjects have little research material available upon which to base models. Early Indy cars may only have a few black and white pictures to draw from, so this makes accuracy using restored cars somewhat dicey. We have to congratulate Replicarz for their desire to create their line of model miniatures as accurately as possible which you can see in enlarged photos at the bottom of the page. Joe Leonard won a single race in 1970 and again in 1971 as the teammate to Al Unser in the Parnelli Jones run team. Unser won the 1970 Indy 500 and 9 other races that year. Leonard was entered in 3 races in 1970, winning the Milwaukee race right after Indy. 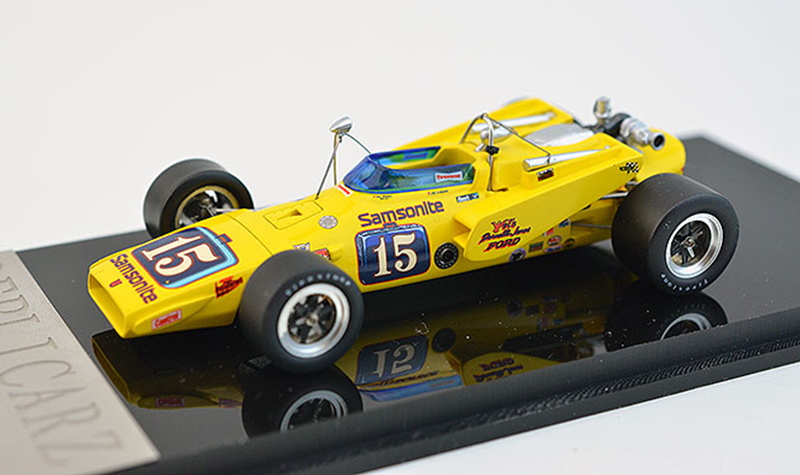 In 1971 Unser won the Indy 500 again in a Jones-entered Colt. Leonard was his teammate for the season in a Samsonite Luggage sponsored car. Unser won 5 races in 1971 but Leonard won just the inaugural Ontario 500 race. Leonard racked up enough points to win the USAC championship anyway while Unser finished only 4th in the championship. At left is Leonard’s Indy 500 entry where he did not finish. It’s still a worthwhile and colorful addition to your Indy 500 collection. The winner of the 1939 Indy 500 driven by Wilbur Shaw. The car was a repurposed Maserati Formula One car imported expressly for the Indy 500. It features fine detail with photoetched parts and minute details that show themselves with careful observation. For a complete overview of this and its sister 1940 Indy winner refer to our previous article. If you are collecting Indy winners, both Boyle Specials are worth obtaining. Later Maseratis were more colorful and entered as Lor Schell and Elgin Piston Pin Specials. They are also available from Replicarz in 1/43 and reviewed by us. 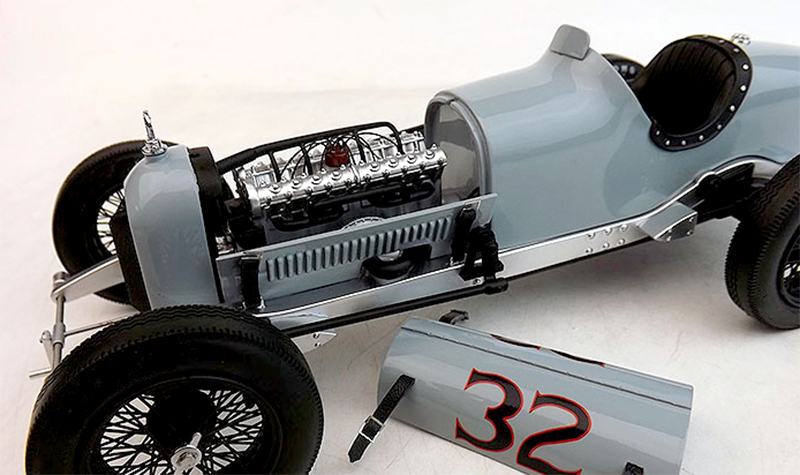 Replicarz began their series of models with 1/43 scale but they quickly branched out to larger 1/18 scale models. The Duesenberg shown at left won the 1927 Indy 500 driven by George Souders. The larger scale allows much more fine and noticeable detail to be included. 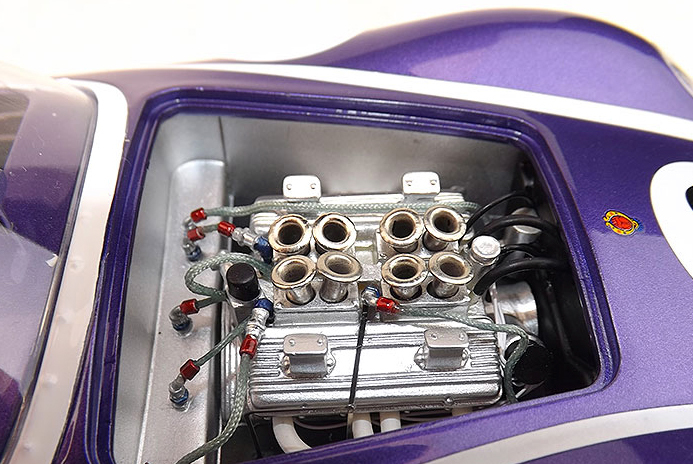 Here the removable hood allows viewing of the fully detailed engine compartment. Hood straps with photoetched buckles keep the hood securely fastened down when closed. Cockpit detail includes glass-faced gauges and pedals, shifter and other controls. Detail also includes the hand crank for starting the car and nice wire wheels with knockoffs. 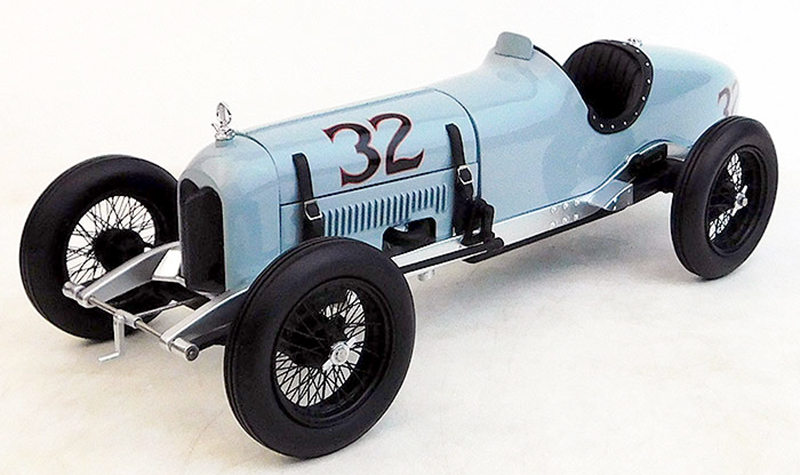 This is a keeper if 1/18 scale Indy winners are your thing. The Scarab was a home-grown challenger to European cars that dominated the sports car scene in the USA. This car was driven by Augie Pabst, who was the heir to the Pabst Beer fortune. It was driven to victory at Continental Divide Raceway in Colorado and was the final win for the Scarab. 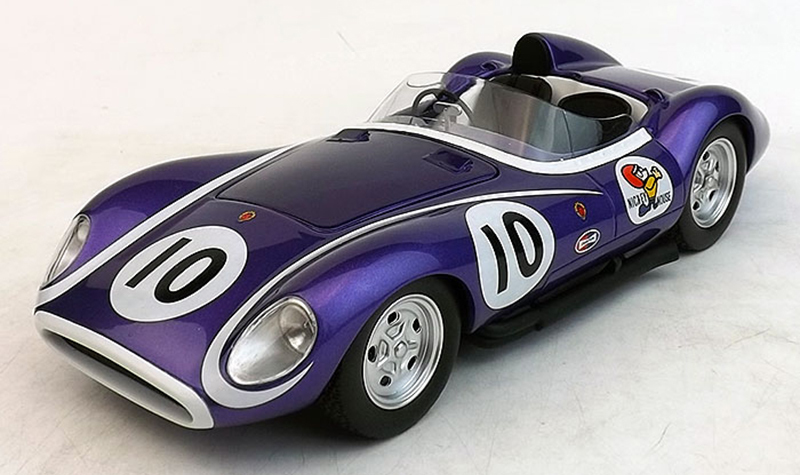 The Scarab model highlights the car’s lithe body lines and its powerful small block Chevy engine. The engine is housed under an opening hood and has full plumbing. The cockpit has tube frame details and beautiful guages. The fabric seat belts are complete with photoetched buckles. Monster side pipes and a finely detailed body finish off the model. This car will feel right at home next to other American sports car legends like the Ford GT and Chaparral. 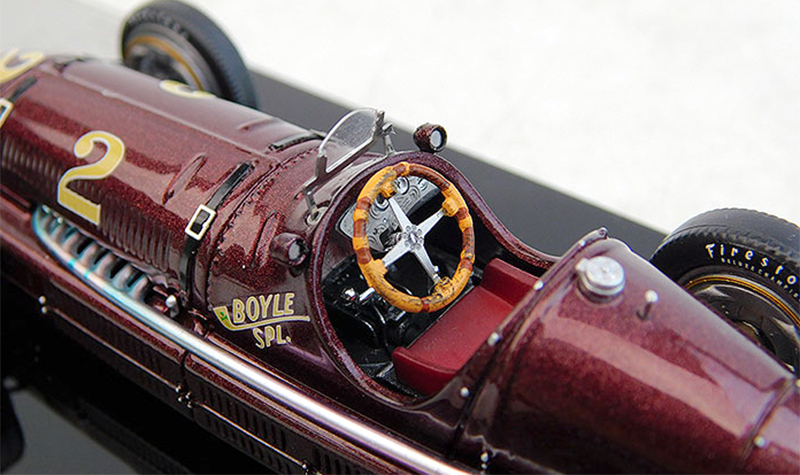 Our final model is the Bonneville Land Speed Record car which owned the fastest speed for a while at 536.71mph. Driven by Art Arfons during 1964 and 1965, it was powered by a J79 General Electric jet engine with a four-stage afterburner. 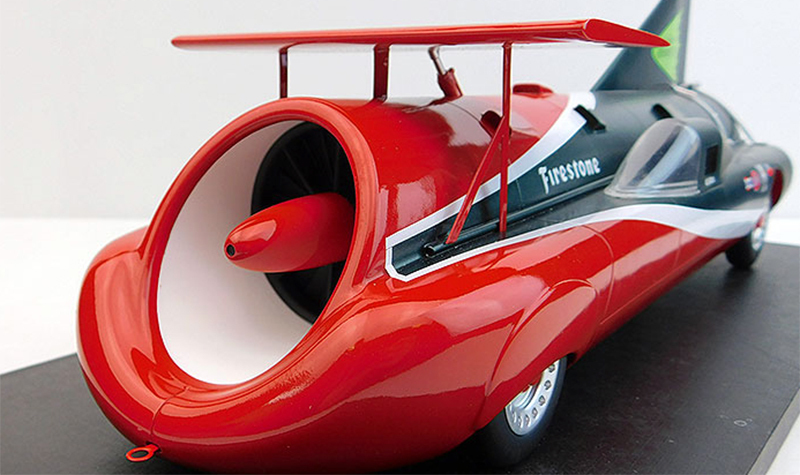 Built by Art Arfons and his half-brother Walt, it held the speed record 3 different times over the two years it ran. It competed against Craig Breedlove’s Spirit of America Sonic I which eventually set the record at 600.601 mph. The model accurately reflects the imposing large front air intake and the equally large afterburner at the rear. 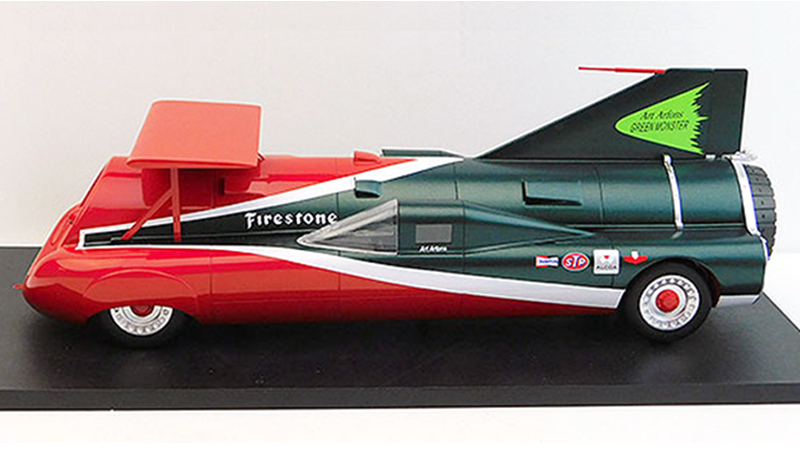 The Replicarz Exclusives Green Monster will dominate any LSR collection with distinction because Land Speed Record models in this scale are scarce. To see the full variety of Replicarz Exclusives in several scales, just click here and more great gift ideas in our Gift Guide.